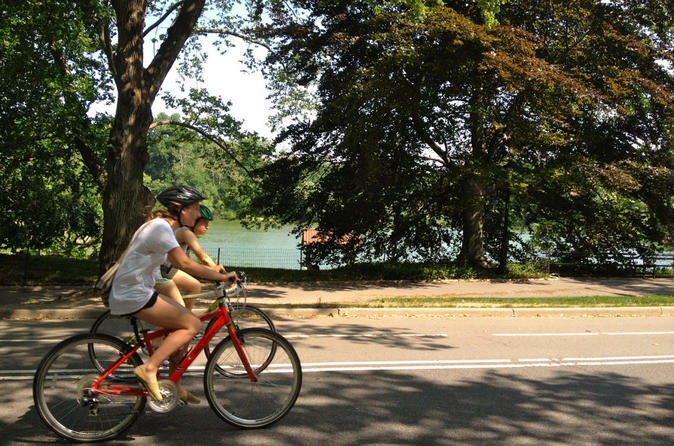 Enjoy a leisurely bike ride through beautiful Central Park! Relax as you follow your guide on a 2-hour ride past both famous and lesser-known sites including the Bethesda Fountain, Strawberry Fields, the Dakota, Cleopatra’s Needle and the Jackie Kennedy Onassis Reservoir. Navigate winding paths while taking in the gorgeous surroundings of one of New York City’s top attractions. This tour is suitable for all fitness levels, and bottled water is included. On this small-group guided tour, enjoy a leisurely bike ride through New York City’s beautiful Central Park! Relax as your guide leads you on a 6-mile (9.6-km) ride through the lush park on a hybrid bike, allowing you to cover a wide variety of surfaces such as paved road and unpaved trails. As you navigate winding paths, get a comprehensive look at the park’s famous sites including the Bethesda Fountain, Strawberry Fields, the Jackie Kennedy Onassis Reservoir and the Dakota, where John Lennon lived. You’ll also pass lesser-known sites such as Cleopatra's Needle, Sheep Meadow, the Shakespeare Garden, the Swedish Marionette Theater and more. This 2-hour Central Park bike tour is suitable for all fitness levels, and bottled water is available throughout the tour.